Holliday Graveyard is one of Parkersburg, West Virginia's oldest cemeteries. 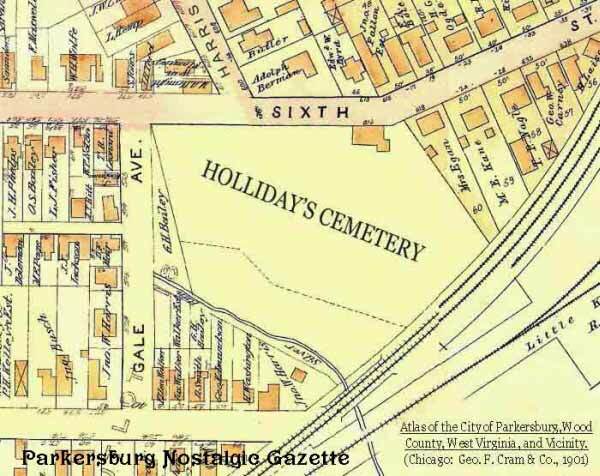 Probably initially referred to as simply the "city cemetery", it later was known as Holliday Cemetery, derived from Mr. William Holliday (ca. 1779 - 1823) who ran a brickyard nearby. When established it was just outside of Parkersburg's early settlement and was accessed by a road that ran along the Little Kanawha River's bank. According to the Parkersburg Gazette, June 30, 1870, "Holliday graveyard was the burying ground from the first settlement at the mouth of the little Kanawha [River]." The earliest recorded burial is that of Rebecca (Mrs. Isaac) Heaton (died 1811), but prior burials probably existed. (Mrs. Heaton's gravestone is now absent. It either has been removed or has crumbled away.) The cemetery was in common use until about the turn of the twentieth-century. Two infants were buried there in the 1960s; however, they have since been disinterred and relocated. In circa 1852 Northwestern Virginia Railroad tracks were laid in Parkersburg and a stretch of track was placed through the southern edge of the cemetery. Neighbors reportedly poured water on the track workers in anger over the railroad's encroachment upon a burial ground. It is unknown if any, or how many, graves were disturbed. As city streets expanded, the cemetery's location was designated as Washington Street near Harris Street, and later, the corner of Sixth Street and Gale Avenue near Harris. The property is approximately 1 3/4 acres in size with a ravine in the center. In 1934, the Works Progress Administration built a native stone wall along three sides of the cemetery. The cemetery was a burial place for all—both wealthy and poor, African-American and white, Union and Confederate, successful tradesmen and vagrants. Unfortunately, time has not been good to the old cemetery and not many of the original tombstones remain. As of the 1880s there were 30 known Union Civil War soldiers' graves—more were probably added later. Today, only 27 soldiers are known (24 Union and 3 Confederate). The old sandstone surrounds of five family plots can still be seen; four are known—Holliday, Neal, Logan, and Morrison. The surrounds originally included either iron picket fences or posts with iron chains. Members of the Farrow and Neal families have been disinterred from Holliday and relocated to Mt. Olivet Cemetery. The large Farrow family stone was relocated to Mt. Olivet; however, the Neal family obelisk-shaped stone was left at Holliday in its original location in the Neal family plot. The Neal family inscriptions have been chiseled out of the marker. A few other individuals also have been moved from Holliday. The cemetery has had a long history of neglect. As early as 1870, newspaper reporters were writing about its shameful state of upkeep. In 1926, Parkersburg city councilmen wanted to convert the property into a public park. In 1937, it was described as a city dumping area with overgrown poison ivy and washed-out graves; and in 1952, it was suggested to turn the neglected property into a children's playground complete with slides and swings. 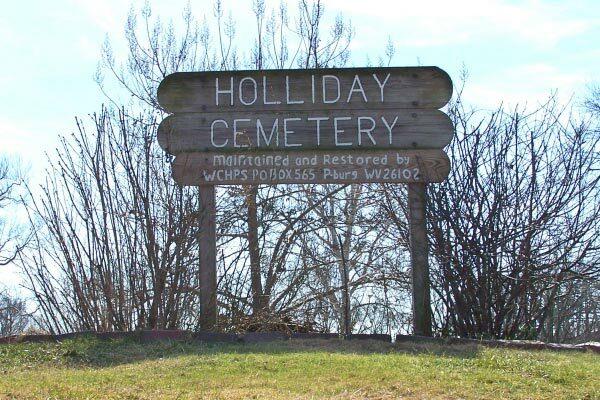 Time-worn graveyards are often full of mystique, and Holliday is no exception. Its grounds have intrigued ghost hunters and spawned folk tales. In the fall of 1983, a series of four fictional stories by Paul Arvidson appeared in the publication The West Virginia Hillbilly. These included: "The Creature from the Holliday Lagoon" (August 6, 1983, Vol. 24, No. 32); "A Ghost of a Story" - about a restless Civil War drummer (August 13, 1983, Vol. 24, No. 33); "More About Holliday Cemetery" - about a dishonest poker-playing Civil War soldier's fate (August 20, 1983); and "Another Holliday Cemetery Story" - also about the creature of the Holliday Lagoon (September 10, 1983, Vol. 24, No. 37). A history of the Holliday would not be complete without mentioning the small, oddly shaped two-story framed dwelling at 520 Gale Avenue that abutted the cemetery. 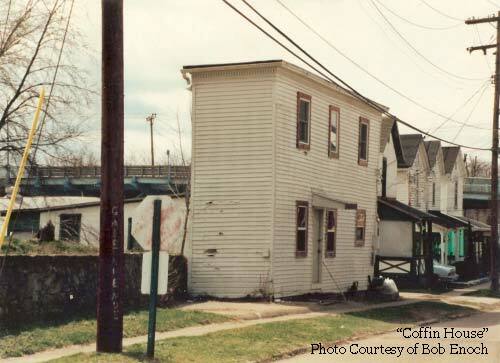 Many locals knew it as the "Coffin House" - a building used for the storage of coffins. It appears, however, that it was used solely as a residence and probably attained its nickname from its coffin-like shape and its close proximity to the cemetery. It was demolished ca. 1995. As the new millennium arrived, the property appeared barren with just a few broken tombstones scattered here and there. Most of the 35 beautiful trees that once were there were now gone. Robert "Bob" Enoch (president of the Wood County Historical and Preservation Society, WCHPS newsletter editor, local history- and baseball history-connoisseur) then "stepped up to the plate" and gave the old place new life. He has done a tremendous job at piecing together the old broken-up tombstones and trying to get most of them upright again. 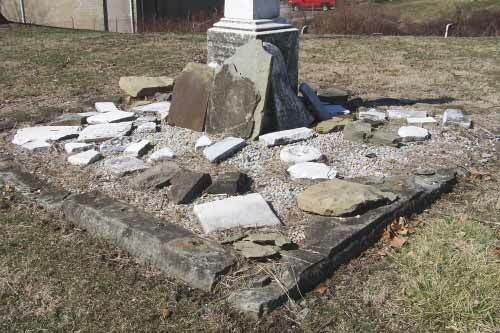 The unidentifiable or very small tombstone fragments that have been found scattered throughout the cemetery property have been gathered and decorously placed around the old Neal marker. 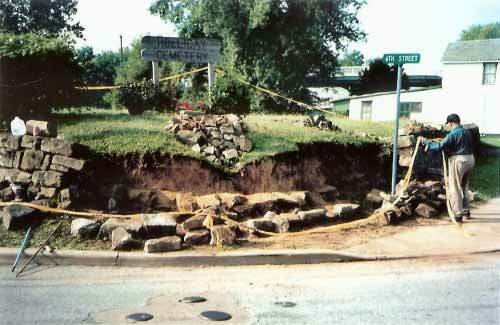 In 2001, Bob and other volunteers completely overhauled the WPA-built stone wall, and later that year, the 12 original veteran's gravestones that were recovered (some found dumped into the ravine with the soldier's original burial location uncertain) were reset grouped together just right of the ravine. When his busy schedule permits, Bob also keeps the brush and weeds cleared and the grass mowed. The Wood County Historical and Preservation Society (www.wchps.com ) is currently raising money to establish a perpetual maintenance fund. Hopefully, a renewed interest in the old cemetery is emerging. Although there is no known sexton's register listing all burials, readings of the graveyard's headstones have been recorded several times, such as the notations of historian John Albert House [1854-1938], the Historic Records Survey funded and conducted by the Works Progress Administration in 1931, and readings conducted by the Old Bible and Cemetery Records Committee of the West Augusta Genealogical Society in 1964. Below is a "new" list of burials, compiled from the above headstone readings, newspaper obituaries, etc. Each entry contains the following information (if available): decedent's name, date of birth, date of death, parents' names, spouse's name, military service, headstone notation, source notation, and obituary information. The "headstone" or "footstone" notation indicates the presence of a gravestone for that individual as of 2011. The source notations (the numbers following each entry) correspond to the sources used. A complete list of the sources appears at the end of this list. Brock, Asbury - [African-American] d:June 9, 1890 in Cleveland, OH, 23y, son of Peter and Mary Asbury 7 [obit DSJ June 9, 1890, pg. 4, column 6] Later relocated to his father's farm. Homeless man who died of burns he received when his "makeshift" bed he was sleeping in above a brickyard's kiln caught fire. Cramer, Walter H. - d:June 2, 1900 [Spanish American War veteran - Company "I", Fourth Reg. Virginia Volunteers] 7 [obit PS June 4, 1900, pg. 3, column 3 and PS June 5, 1900, pg. 1, column 3] Vagrant. While trying to position himself under a train's freight car he slipped and was crushed by the train's wheels. He had no local relatives. Cyphers, John - d:May 14, 1899 7 [obit PS May 15, 1899, pg. 3, column 3] Fell off of O.R.R. trestle while intoxicated and died two days later in city jail. Dorsey, Thomas H. - [African-American] d:Feb. 23, 1884, husband of Martha Grant [Civil War soldier - Company "F", Nineteenth United States Colored Troops] 1 2 3 6 relocated to Spring Grove Cemetery. Elson, George - b:circa 1843, d:April 24, 1863 [Civil War soldier - Company "D", Eleventh W.Va. Infantry] 1 2 3 6 Killed in action. Fairburn, Leonidas Edgar - b:Oct. 24, 1874, d:Jan. 11, 1878, 3y 2m 18d, son of Simon and Bettie Mitchell (Williams) Fairburn 2 According to a July 1941 Parkersburg News article entitled, "Afternoon In An Old, Old Graveyard in Parkersburg", the Fairburn children had a paired stone--two tablets joined at the top. Farrow - Hiram Perry Farrow, his two wives, and several children's names are all engraved upon a large granite block family stone. This stone was noted by John House. The Farrows were disinterred and the large granite stone relocated to Mt. Olivet Cemetery on June 17, 1932, by Elizabeth "Lizzie" C. Farrow Prince, a daughter of Hiram Farrow. Fisher, Charles C. - d:circa 1824, d:Nov. 11, 1882 7 [obit PWS Nov. 18, 1882, pg. 3, column 7] Drowned in the Ohio River. Fountaine, Taylor - [African-American] d:April 4, 1887, 29y headstone 2 7 [obit DSJ April 5, 1887, pg. 4, column 3] Shot by Charles Sargent during a drunken brawl on Market Street. Hilton, Charles - d:1898 7 [obit PS Sept. 8, 1898, pg. 1, column 2] His body was "secretly" buried in the dawn of morning, possibly due to having died of a contagious disease. Laughlin, Edward - d:Oct. 31, 1894, 3y 6m 4 Burned to death in house fire on East Depot Street. Neal, Ephlis - b:Oct. 29, 1779, d:Jan. 1, 1852, wife of John Neal 1 relocated to Mt. Olivet Cemetery November 1, 1916, by Dr. Daniel R. Neal, Jr.
Neal, John - b:May 10, 1776, d:Oct. 14, 1823, son of James and Hannah (Hardin) Neal / O'Neall, husband of Ephlis Hook 1 2 3 relocated to Mt. Olivet Cemetery November 1, 1916, by Dr. Daniel R. Neal, Jr.
Nixon, Mary - d:Nov. 26, 1825, 26y, dau. of George and Ruth Kyger, wife of Jonathan Nixonheadstone fragment [uncovered March 21, 2010]. She was relocated to Riverview Cemetery at an unknown date. Reed, Ransom - [African-American] Birth and death dates unknown. Former slave of Harman and Margaret Blennerhassett. Sargent, Charles - [African-American] d:March 8, 1888 Died in jail of tuberculosis. He was convicted of shooting and killing Taylor Fountaine. Thomas, James "Crap Jim" - [African-American] d:June 21, 1898 7 [obit DSJ June 21, 1898, pg. 1, column 7 and DSJ June 22, 1898, pg. 1, column 6] Murdered by Ira Harris. Troy, George W. - d:August 11, 1897, 30y 7 [obit PS Aug. 11, 1897, pg. 1, column 4 and PS Aug. 13, 1897, pg. 5, column 3] Committed suicide in the Palace Hotel, Parkersburg. He was from Calhoun County, W.Va.
Tucker, Mrs. Isaiah - d:July 19, 1889, 50y 7 [obit DSJ July 19, 1889, pg. 3, column 4] Drowned in the Little Kanawha River. 1. Some Early City, Village, and County Burying Grounds, by John A. House, "Holliday Graveyard"